IHRC is calling on the Nigerian authorities to immediately and unconditionally release at least 15 members of the Islamic Movement of Nigeria who were arrested last night as they made their way to events in Kaduna city marking the Islamic month of Muharram. The detained, who include women and children, are all supporters of the IMN which was proscribed last week by the Kaduna state government. Soldiers fired tear gas to prevent the worshippers from reaching their destinations, and there are reports of multiple injuries with at least one person being hit by gunshots fired by the security forces. In the context of the relentless persecution of the IMN by Nigerian authorities, IHRC is genuinely concern for those detained. Earlier this week Kaduna state government proscribed the IMN, making membership of the organisation illegal and imposing a prison term of seven years and/or an unspecified fine for those who violated it. Because the IMN has no formal membership structure it seems that its enforcement will apply to those who simply support the group or follow the Shia school of thought. As was feared, the new law appears to be being used as an attempt to prevent the movement’s supporters from attending ceremonies commemorating the month of Muharram, which carries great significance in the Shia calendar. 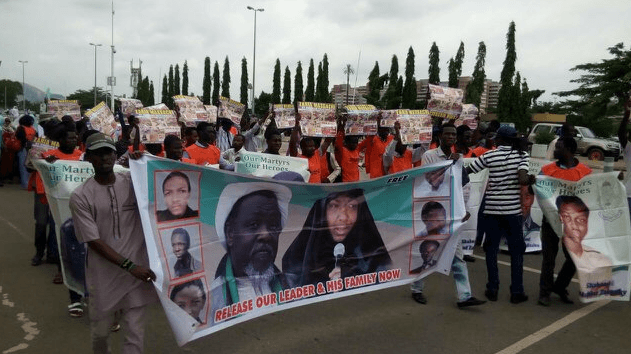 The IMN’s leader Sheikh Ibrahim Zakzaky and his wife Zeenat have been in detention without charge since December last year when they were shot during an army assault on the IMN in Zaria that left over 1000 people dead. Sheikh Zakzaky has already lost the use of an arm and one of his eyes and risks losing his sight altogether unless he receives the proper medical attention. The state government has also issued an arrest warrant for Dr. Ibrahim Musa, the IMN’s most prominent spokeperson. Dr. Musa identified himself as a spokesperson of the IMN shortly after the ban was announced in public statements condemning the decision.